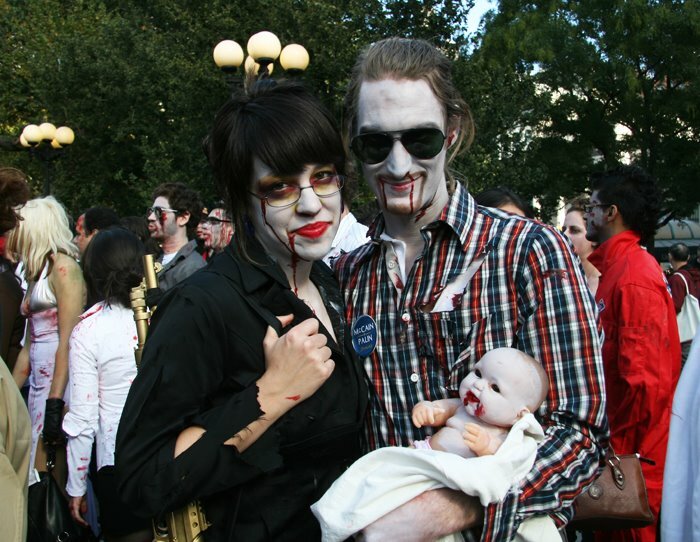 This was the fourth annual Zombiecon, a celebration by the living dead. There is very little information about the event on the official website. The dearth of info, either pre or post the event, is reminiscent of a Flash Mob. One observer called Zombiecon a "weird hybrid of flash mob, pub crawl, and “Thriller” video." However, it is not truly a Flash mob because of their spontaneous, unplanned nature, but the loose structure of this event does give it the feel of one. I wrote about Flash Mobs and Smart Mobs in my articles on the International Pillow Fight and the Silent Rave Part 1 and Part 2. To be notified and involved in these events, you will need to be in the loop or connected and the same appears to be true with Zombiecon. The New York Times said "this loosely organized spectacle will roam the streets of Manhattan, dressed in their best grave-defying fashions and gaping wounds, spending the afternoon scaring children and shopkeepers and hunting for brains (and beer)"